Three partylist representatives filed separate House resolutions that will look into the contractualization and alleged unfair labor practice of network giants, as response to the regularization suit filed by the members of Talents Association of GMA Network, Inc. (TAG). On February 9, ABAKADA Partylist Rep. Jonathan dela Cruz filed a resolution to look into the industry-wide contractualization practice, with the 117 members of TAG as its case study. Two party-list representatives filed separate House resolutions that will look into the contractualization and alleged unfair labor practice of network giants, as response to the regularization suit filed by the members of Talents Association of GMA Network, Inc. (TAG). And on February 10, Rep. Emmi de Jesus and Rep. Luz Ilagan of Gabriela Partylist, and Quezon City District 6 Rep. Jose Christopher Belmonte filed a resolution to have the House Committee on Labor conduct an inquiry into TAG’s fight for regularization. The case is pending before the National Labor Relations Commission (NLRC). TAG and GMA Network have filed their position papers. But meanwhile, GMA Network is withholding the last salaries of the 52 TAG members whose contracts were not renewed last December 31, 2014. In text messages sent by Program Administrators to TAG members last January 10 (the payroll schedule), they explained that the Network’s Finance Department are still waiting for clearance related to accountabilities and documents that have to be turned over. TAG members have not been given their final salaries as of this writing. But in a brazen move, Program Managers set a condition to several TAG members from some Public Affairs programs to receive their salaries --- by returning to work and extend their service. Network Managers talked to TAG members directly to explain that the Network’s Project Employment Contract (PEC) has been postponed, allowing for talents such as TAG Members who did not sign the PEC to continue to work by signing renewal of their ‘talent services’. Since the non-renewal of contracts last December 31, some programs have had difficulty filling in the vacant positions, which has resulted to the management’s latest action: to offer TAG members their jobs back. TAG is convinced that this latest move by the Management only proves that talents are desirable to the network; and desirability is one important qualification to be a regular employee. However, managers could not give direct answers as to how long will they be allowed to work under the renewed talent service agreement. More importantly, managers could not also say whether they will still be allowed to work once the PEC is finally implemented. With unclear work provisions, TAG members refused to take up the offer. NLRC arbiters are set to issue a decision on March. As in any case, TAG and GMA Network can appeal the decision to the Commissioners until a final verdict is given. TAG is confident that the Commission will favor its case. Meanwhile, the response from lawmakers is already a positive development not just for TAG but also for the whole industry which has endured decades of unfair labor treatment. 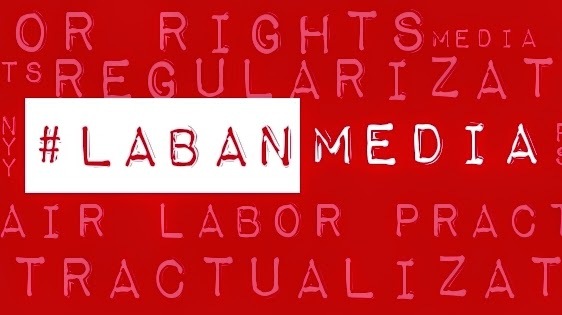 The general public is encouraged to help give voice to the plight of media workers in the country by using #LabanMedia on social media beginning February 9.